Australia's science agency has warned that spring rains have created ideal conditions for a mouse plague in the country's breadbasket. Victoria and South Australia are experiencing higher than expected numbers of mice, the CSIRO said. The agency characterises a mouse plague as more than 1,000 mice per hectare (405 per acre). If conditions bring enough food, the population could hit that number within months, researcher Steve Henry said. "We had a terrific spring this year which lead to record crops," Mr Henry told the BBC. "Those conditions that lead to great crops are also really favourable for mice." The CSIRO could not give a current figure for mice per hectare, but said data from traps and anecdotal evidence pointed to a population spike. About five mice per hectare would be considered normal, Mr Henry said. 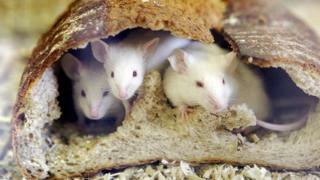 Mouse plagues regularly occur only in Australia's grain belts and a province in north-west China, the CSIRO said. Victoria and South Australia occupy a large part of the Murray-Darling Basin, a fertile region accounting for almost 40% of Australia's agricultural income, according to the government. Outbreaks of mice create a significant financial hit to farmers who are forced to buy costly bait and often re-sow crops. Mr Henry said outbreaks also led to stress in rural communities. "It's the fact that they are invading people's houses, they're in their vehicles, everywhere they turn around there's a mouse," he said. "People in the cities are aghast when they have a mouse in the house. These people in the country, they're jamming up every crack in their house with steel wool to stop the mice from getting in." Mice were introduced to Australia by European settlers. They have few natural predators and face little competition from native wildlife.